It perhaps would be useful if we could start to respond to questions 3 and 4 first. As you are aware, while publishing case reports, we are limited by the number of images that are allowed. The patient did indeed have left main bronchus obstruction and not below that. This was confirmed by bronchoscopy, CT scan and chest radiograph. The physiological details provided also confirm this. In answer to question 4, may we point out that we were not describing complete obstruction, but "almost complete obstruction." The characteristic appearance of the flow volume loop (FVL) and reduction in FEV 1 and peak expiratory flow rate (PEFR) confirms airflow through the obstructive lesion: (1) the changes in FEV 1 , PEFR and characteristic FVL are consistent with involvement of a large airway; (2) these physiological changes, especially the FVL changes, do not occur in airways of less than 2 mm in size, i.e. a peripheral airway; (3) the physiological findings we presented are usually seen when a large airway orifice narrows to less than 80% of its caliber; , (4) symptoms such as dyspnea usually do not occur unless the airway is reduced to under 75% of its normal lumen  (our patient's exercise tolerance was reduced from normal to 100 yards); and (5) on direct vision via the bronchoscope, the lesion was occluding the orifice of the left main bronchus almost completely; hence, the description of "almost complete obstruction" as opposed to complete or partial obstruction. We do acknowledge that the above features are limited to someone with an otherwise normal lung. The spirometry and FVL are not always reliable, especially if the patient has a background of obstructive airways disease. In answer to question 3, if the patient had a lobar collapse as the questioner suspects, then the physiological changes would have been that of a lobar collapse or similar to that of a lobectomy, i.e. reduction in FEV 1 with relatively preserved or reduced vital capacity and PEFR with a normal shaped but smaller FVL. This clearly was not the case. Moreover, on careful observation of the image published, one can see the posterior membranous tracheal wall, which helps in identifying the left and right main stem along with the main carina. Normally, there is no other view during bronchoscopy that would give such an anatomical layout. Of course, this can sometimes be confused with division of the left lower lobe and upper lobe. If, however, the obstruction was in the left lower lobe, the upper lobe would have been patent and toward the right in the given image. The questioner was alluding to a possibility of left lower lobe basal segmental collapse. We can confirm this was not the case as: (1) basal segments have three divisions (a. anterior with medial branch; b. posterior basal; and c.lateral basal segments); there are only two divisions at the site of obstruction as can be seen; and (2) there is a necrotic lymph node protruding into the left main stem. We have not yet known a case of a lymph node eroding into basal segments that was histologically confirmed. In answer to question 1, the lymph node was at station 7. 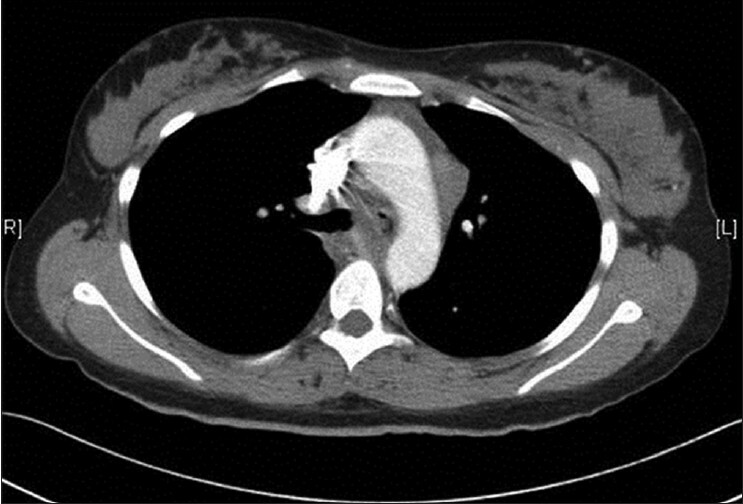 Indeed, the diagnosis of mediastinal lymphadenopathy was based on chest X-ray and CT scan, as mentioned in our report [Figure 1] and [Figure 2]. With regard to question 2, unfortunately, the physiologist who performed the lung function post-treatment 1 year later did not record the inspiratory limb of the FVL and we therefore do not have records for this. However, it was a fixed upper airway obstruction as seen on the first measurement. When the obstruction is relieved, most often, both inspiratory and expiratory airflow improve simultaneously. 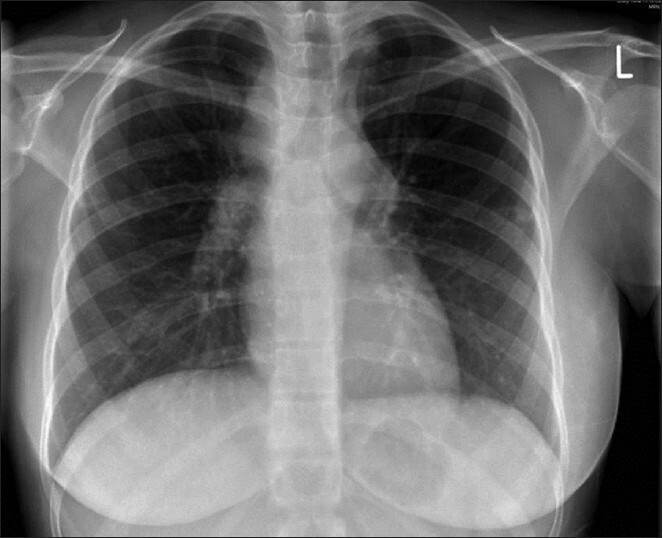 The questioner is correct in assuming that the patient had not had any symptoms of dyspnea prior to development of this late paradoxical reaction. We trust this adequately answers the queries. Dr. Ahmed Liju: diagnosed upper airway obstruction, prepared the manuscript for publication. Dr. Milburn: Diagnosed patient with tuberculosis and commenced treatment. Dr. Neel Sharma: Literature search and collected evidence and helped with manuscript. 1. Mehta A. Comments on "An unusual cause of bronchial obstruction". Lung India 2012;29:300. 2. Liju A, Sharma N, Milburn H. An unusual cause of bronchial obstruction. Lung India 2012;29:182-4. 3. Ernst A, Feller-Kopman D, Becker HD, Mehta Atul C. Central airway obstruction. Am J Respir Crit Care Med 2004;169:1278-97. 4. Acres JC, Kryger MH. Clinical significance of pulmonary function tests: Upper airways obstruction. Chest 1981;80:207-11. 5. Harley HR. Laryngotracheal obstruction complicating tracheostomy or endotracheal intubation with assisted respiration. A critical review. Thorax 1971;26:493-533. 6. Lardinois D, Leyn PD, Schil PV. ESTS guidelines for intraoperative lymph node staging in non-small cell lung cancer. Eur J Cardiothorac Surg 2006;30:787-92.